Type and Characteristics - 18-gun sailing sloop, Boston-class, built by Philadelphia Navy Yard, laid down 1825, launched 1828, commissioned 6 November 1828, 614 long tons, 127ft long x 34ft 6in beam x 16ft 6in draft, armed with 4-8in shell guns and 16-32pdrs, 150 crew, first commanded by Commander John Gallagher. Log Period and Areas of Service - 1853-55, Perry's Expedition to Japan, Taiping Rebellion. 14 February 1853 - Recommissioned. Joined East Indies Squadron. 13 February 1854 - Entered Tokyo Bay with Commodore Perry's Squadron on first visit. 1855 - Helped protect American interests during Chinese Taiping Rebellion. 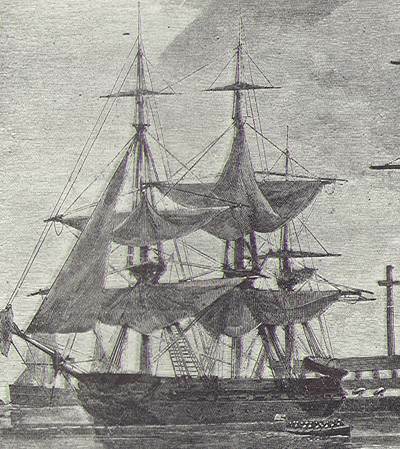 30 September 1856 - Decommissioned at Portsmouth Navy Yard, NH. Fate - Decommissioned at New York Navy Yard on 4 February 1863, and sailed for Portsmouth, NH on 17 October to serve as receiving and guard ship. Broken up there sometime between 1870 and 1872.